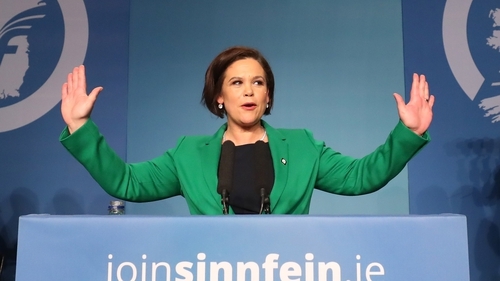 Mary Lou McDonald has been formally elected as President of Sinn Féin. Ms McDonald was formally elected at a special Ard Fheis this afternoon in front of around 1,500 party delegates at the RDS. Ms McDonald takes the reins from Gerry Adams who led the party for more than 34 years. Ms McDonald, a TD for Dublin Central, was the sole contender for the job and has been president-elect of the party since the beginning of this year. Ms McDonald told delegates that she wants to double the size of the party in the years ahead, adding that the party's purpose would be to win elections. "Our purpose is to win. To win elections, to increase our political strength, to realise our ambition of being in government, north and south," she said. Ms McDonald also told delegates that her party is "up for a deal" and committed to "real power-sharing" in Northern Ireland. "This is not about orange and green. This is all about rights," she said, adding that the talks are ongoing and Sinn Féin is committed to a positive outcome. On the Eighth Amendment, she said the party "will campaign enthusiastically for repeal". She acknowledged that some republicans will not share this analysis. "Despite differing views, I believe that the referendum debate can be handled with respect and sincerity," Ms McDonald said. On Irish unity, she said this could not be a crude exercise of "simply stitching north to south and returning to business as usual". "The war is over. There is no value in engaging in the blame game. We do not have to agree on the past. We must only agree that the past is never again repeated. On other things, we can agree to disagree," she said. She also told delegates that a "new chapter on the road to the Republic has begun". "We are the generation of republicans who will see the rising of the moon. Sinn Féin in government both North and South," she said. She also said the party would ensure prosperity would be shared. "To those who struggle no matter how early they get up, how hard they try, no matter how hard they work. I want to say that Sinn Féin sees you. Sinn Féin hears you. Sinn Féin will fight your corner." Michelle O’Neill has also been formally been elected as Vice President of the party at the Ard Fheis. The MLA and leader of Sinn Féin in Northern Ireland said the party is ready for Government both north and south. Ms O'Neill told delegates that she expects the talks to restore the power-sharing institutions at Stormont will conclude next week. MEP Lynn Boylan opened the Ard Fheis by describing Ms McDonald and Ms O’Neill as "formidable women" and not "dainty petticoated revolutionaries". There was also rapturous applause when MEP Martina Anderson praised the contribution of Gerry Adams to both the party and the peace process. Today marks the high point of Ms McDonald's political career. She was first elected to the Dáil seven years ago on her third attempt, and she was an MEP for Dublin from 2004 to 2009. In a statement last night, Mr Adams said he believes that a way forward can be found to restore the power sharing executive at Stormont. He said too that the party's new leadership offered a bright future.